Last September we critiqued the Draft Transparency International guidance for due diligence on transactions. The draft guidance was unrealistic in a couple of key areas, broadly timing and proportionality. The final version of the Transparency International Anti-bribery due diligence for transactions has been a long time coming but it’s been worth the wait. We understand that the delay was due to an extensive re-write with extensive consultation. Of particular note is the contribution of Randal Barker, Vice President – Group Legal at BHP Billiton, Chris Vaughan, Chief Corporate Officer at Balfour Beatty and Benedict O’Halloran, General Counsel – European Transactions & UK at General Electric on behalf of the GC100. The result is a balanced document which contains great advice for organisations undertaking M&A and investments in a real world setting. The two main differences between the draft and final guidance….drum roll…. Timing: It is acknowledged that the quantity and quality of due diligence pre-acquistion is limited and therefore that in many cases due diligence will have to be undertaken after the acquisition. Proportionality: The guidance acknowledges that when it comes to transactions and due diligence it is really ‘horses for courses’. The guidance flags what TI consider will typically feature in a thorough review, in other words where proportionality calls for a ‘drains up’ look at a business. “Detailed review of the target’s markets and competitors’ activities to help form an assessment of whether bribery is a known or likely factor. Corporate intelligence and background checks undertaken on the target’s business and key owners/directors and management. The target’s anti-bribery programme examined in detail to assess its adequacy and any risks of bribery. Assessing the tone from the top of the target company, for example through using interviews with senior managers and directors to discuss the target’s anti bribery programme, issues and risks. Interviewing management representatives in key functions that represent bribery risks (such as sales directors in certain markets). This will also involve assessing their openness to post-acquisition improvement in the target’s anti-bribery programme as part of the integration process. External interviews and site visits. In addition to internal sources within the target, external sources will be interviewed including obtaining informal comments from actors within the relevant sectors and countries, such as customers, suppliers, industry experts, regulatory authorities, business associations, embassy officials, NGOs. Walk-through tests, carried out to confirm that policies and procedures are effectively implemented. Review of data provided by the target company – this will usually be located in a data room. “1. The purchaser (or investor) has a public anti-bribery policy. 2. The purchaser ensures it has an adequate anti-bribery programme that is compatible with the Business Principles for Countering Bribery or an equivalent international code or standard. 3. Anti-bribery due diligence is considered on a proportionate basis for all investments. 4. The level of anti-bribery due diligence for the transaction is commensurate with the bribery risks. 5. 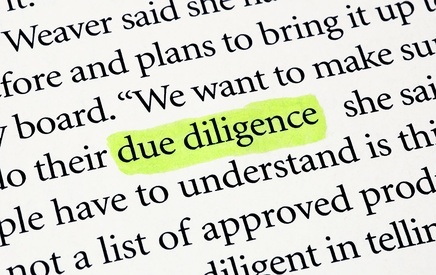 Anti-bribery due diligence starts sufficiently early in the due diligence process to allow adequate due diligence to be carried out and for the findings to influence the outcome of the negotiations or stimulate further review if necessary. 6. The partners or board provide commitment and oversight to the due diligence reviews. 7. Information gained during the anti-bribery due diligence is passed on efficiently and effectively to the company’s management once the investment has been made. 8. The purchaser starts to conduct due diligence on a proportionate basis immediately after purchase to determine if there is any current bribery and if so, takes immediate remedial action. 9. The purchaser ensures that the target has or adopts an adequate anti-bribery programme equivalent to its own. Additional very practical commentary offering more guidance relating to the interpretation, implementation and execution of each of these is contained in the guidance. They would be foolish not to read it.